Sometimes the big tent-pole, triple-A title model doesn’t work, and a studio folds in on itself. This is a very common occurrence, and it’s rare that any given developer in this situation will regain their footing and continue making games. Thankfully, Double Fine, creators of Psychonauts, managed to dig themselves out of the Brutal Legend hole and converted their business model to making smaller, less financially risky downloadable games. This meant they were free to experiment with different genres and flex their witty writing muscles without subjecting themselves to the sometimes cruel whims of the video game playing masses. Starting off with Costume Quest and leading into Stacking and Trenched (which I’ll get to in a moment), Double Fine has proven that they know how to make great games, and they’ve finally found themselves an audience that is receptive to their hard work. I did miss out on Costume Quest and Stacking (though I have heard they’re excellent) but I decided to check out Trenched, a mech combat/tower defense game, because those two play-styles mashed together sounds like a hell of a good time and it has co-op, which is always a plus in my books. 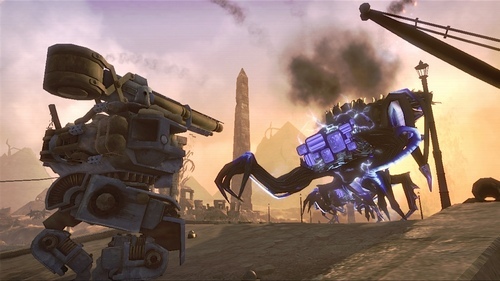 Putting you in the boots of a Mobile Trenched Division Marine, Trenched has you piloting a giant mech (called a Trench, if you haven’t figured that out yet) against the evil Monovisions, artificial constructs made out of televisions. To do this, you first equip your Trench with one of two chassis (assault or engineering) and either deck yourself out with massive guns or opt for the more defensive route by stocking up on fixed Emplacements. Defeating the Tubes will give you scrap and loot, the former of which is used to build and upgrade your turrets. As you might expect from such a unique blend of genres, the game is a ton of fun, alternating between blasting Tubes with your giant cannons and ducking back behind your defenses when the action gets too hot. You can also customize your Trench with different pain schemes and ability-boosting legs (like sprinting or fast reloading) and you can deck out your Marine with different pieces of gear (that are cosmetic only, but hats do change your salute). Double Fine’s penchant for hilarious writing is out in full force in Tenched; more than once I’ve actually given a chuckle at a piece of dialogue, and the alternate 1920s setting is really cool. I only have a couple of nitpicks, like the unskippable cutscenes and the fact that difficulty doesn’t adjust if you add more people to the game, making some levels a breeze. Other than that, though, Trenched is a heck of a lot of fun, and is something you should look into if you’re hurting for good games right now. Has anyone else been playing Trenched, and what do you think of it? Are you going to give it a shot after this? I’m always down for some co-op, so if you do get the game, hit me up on Xbox LIVE and we’ll kill some Tubes together. I may have to try the demo. I’m pretty much done with tower defense, but this sounds different enough to warrant a shot. I’ve given Double Fine’s other games a miss but this sounds like a lot of fun! This one’s getting good reviews, too, as all their games do. Costume Quest was fun, if short, and I played the Stacking Demo, which was fun enough, I just haven’t got around to buying it. Always willing to give Double Fine the benefit of the doubt. The ideas that come out of there are usually spot on.